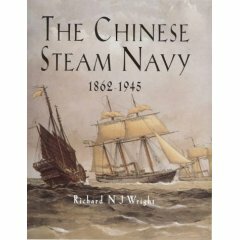 Richard Wright’s Chinese Steam Navy looks at the Chinese Navy from around 1860 through to 1945, the period that the Chinese first looked at expanding their navy with modern ships. The book covers the Sino-French War of 1884 and the Battle of Foochow in particular as well as the Sino-Japanese War of 1894-5 and the disastrous Battle of the Yalu. The Warlord period of the early 20th Century is also covered as well as the war with Japan over the period 1937 to 1945. The various vessels purchased and used over the period are covered as are the basic philosophies of the navy in that period. The vessels are described as are the battles. This book is one of the favourites on Thomo’s reading list at the moment. In addition to the vessels being described, the book also covers each of the major naval bases throughout China. I cannot recommend this book enough. If you have any interest in naval vessels and in particular, those of the 19th Century, then this book is a “must have”, along with the likes of Busk’s “The Navies of the World”.